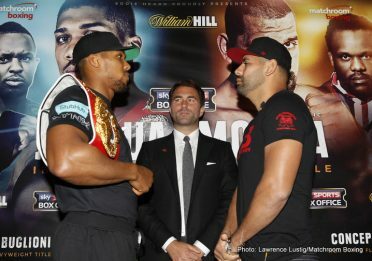 Undefeated IBF Heavyweight World Champion Anthony Joshua (17-0, 17 KOs) and challenger Eric Molina (25-3, 19 KOs) went face-to-face Friday at the kickoff press conference at Dorchester Hotel in London to formally announce their heavyweight world title fight on Saturday, Dec. 10, live on SHOWTIME from Manchester Arena in Manchester. There were 17,000 tickets sold on the first day to purchase tickets. 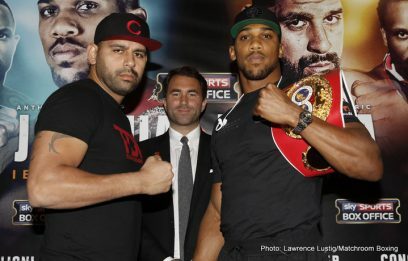 Joshua, a British sensation and the 2012 Olympic Games heavyweight gold medalist, will be making the second defense of the title he won over Charles Martin last April 4. Joshua knocked out previously unbeaten Dominic Breazeale in the seventh round last June 25 in his initial defense. Molina will be getting his second opportunity at a world title. Molina has won two straight since challenging WBC title holder Deontay Wilder in 2015, including a 10th-round TKO over former world champion Tomasz Adamek last April 4 in Poland. “I don’t think that I’ll be rusty. I’m not going to say camp is smooth or great because it’s always tough and exhausting for the body. I needed a break because I live in the gym, it’s what I’ve been doing since I was 18 and I haven’t taken my foot off the gas since. The task is to express myself under the bright lights in the arena and show what we’ve worked on in the dark corners of the gym. 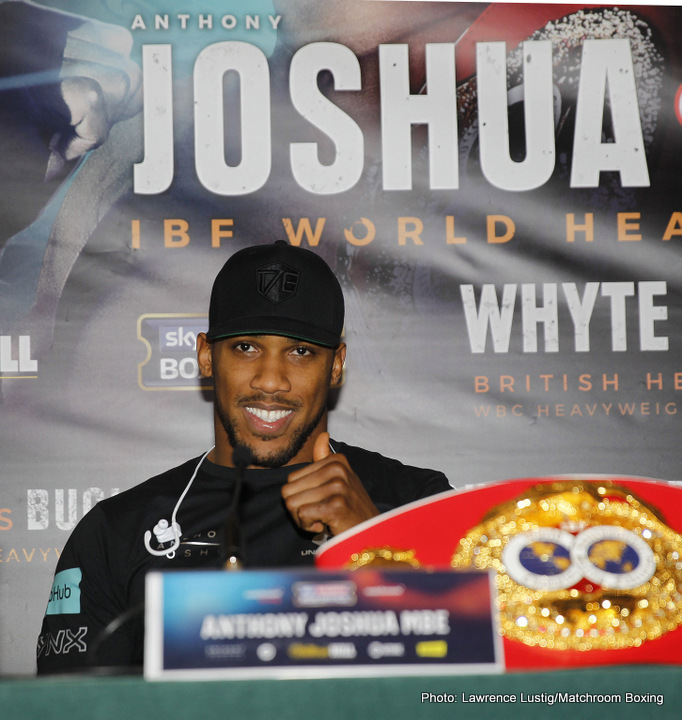 “I started preparing my body for camp and then training for this date. 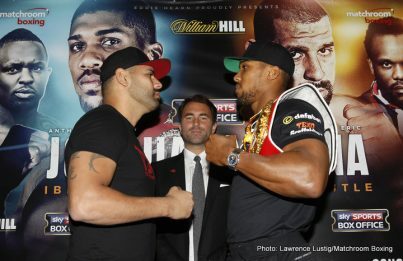 I don’t want to mention Wladimir Klitschko too much because that’s not the relevant opponent – Eric Molina is the man that will stand across the ring from me on December 10. He’s a tough competitor and represents a strong challenge to me. We are competing for my belt and the guys that want to become world champion raise their levels by 50-60 percent. 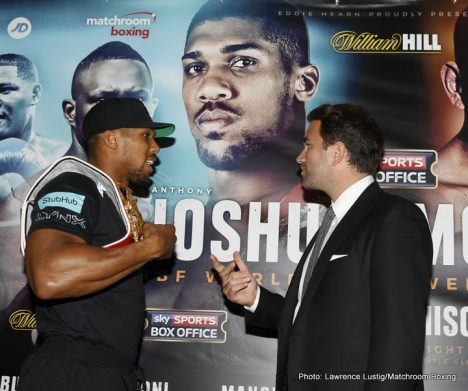 “There’s nowhere to hide on fight night. There’s no change in my focus for Eric. Wladimir doesn’t enter the equation for me. People will talk about him and I’ll answer the questions, but that’s as far as it goes. He’s not in my mind, Eric is. “It takes courage to step into the ring. Deontay Wilder is known as a one-punch KO artist and Eric stood up to his power, so it shows that he’s here to push the champion and take my title. “I don’t get involved in other people’s issues or stories, it’s nothing to do with me. It wasn’t that long ago that no one cared what I was doing, so I don’t really have to prove myself to anyone aside from myself. “The division has been blown wide open but they’ve been saying that for a while and they will keep saying it until someone dominates the division again. It’s not so much about brand and hype, it’s about guys like Eric that come with true heart and are gladiators and fight for the love of the sport, and leave everything in the ring on fight night. “I’ve been in these fights before. I have no amateur experience so I’m learning no the job — and I’m getting better every fight. I fought five rounds against Wilder with a busted ankle, so everything you saw from me was done on one ankle. That’s the kind of guy this young man is facing. I fight with everything I’ve got. Even if I’m hurt, I still fight, because I know that one punch at any given moment can win me the fight. Anything can happen in the heavyweight division. “I knew this fight was coming my way because nobody wants to fight him. Let’s be real. All the other fighters want to go and fight other guys and for the other belts and not face Anthony Joshua. I’m a guy that’s been in with Wilder – no one wants to fight Wilder, but I did, and that’s why I’m in London today and will be in Manchester on Dec. 10 putting it all on the line, body and soul. I want that IBF belt, I don’t have the option to go for another belt or down another route. This is it for me, and that means he’s going to have the toughest fight of his career, I can guarantee that. “Tomasz Adamek had never been KO’d, so the momentum from that win in Poland was big. I felt it was time to take time off from work and put 100 percent into this. “Back home, people know me as a certain type of fighter. 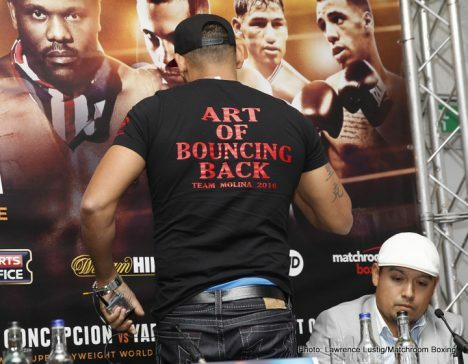 On day one of my career I lost in the first round and that’s why on the back of my shirt it says ‘The Art Of Bouncing Back.’ Those aren’t just words. Boxing is the most brutal sport when it comes to trying to bounce back. Once you lose, everybody is gone from your side. There are fighters out there that say they want to bounce back but they don’t have the guts to put themselves in a position to do it. I put myself in the fight with Wilder and I went to Poland and beat Adamek to bounce back and show people who I am.